The original PC release of Dark Souls is criticised for many reasons, locking the game to the same maximum framerate of 30FPS as consoles while limiting the game's internal resolution to 1024x720, a sub 720p resolution. These limitations created the need for DSFix, a mod which allowed PC gamers to adjust the game's resolution and framerate limit, enabling PC users to take advantage of their higher-end gaming hardware. If there is one thing that Dark Souls Remastered promises, it is the ability to play the game at 60FPS and higher resolutions without the need for mods, though aside from that nothing much has changed in Dark Souls' Remaster. 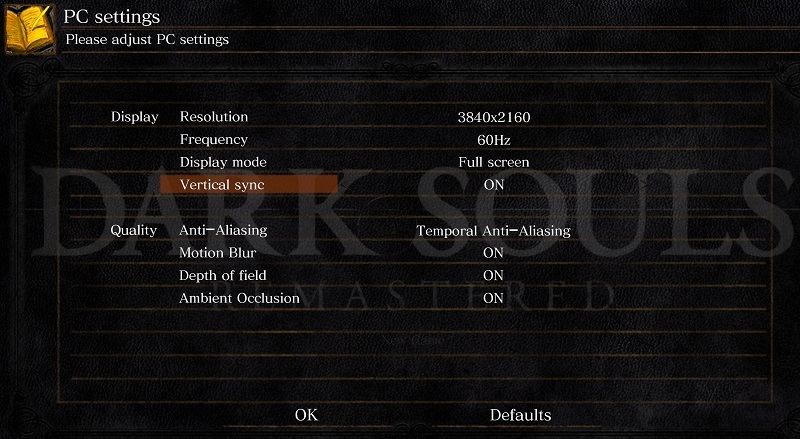 Temporal Anti-Aliasing has also been added to Dark Souls, offering players enhanced anti-aliasing with a minimal performance impact, though FXAA is also available if players prefer. While 60FPS is achievable here, we must note that gameplay speed is tied to framerate and that the title's maximum framerate is 60FPS, with the game offering no 30FPS option. Those running at sub-60FPS framerates will be playing the game in slow motion, delivering users an extremely strange gaming experience. Options-wise, Dark Souls: Remastered offers players eight total graphical options, resolution, frequency (should be 60). display mode, V-Sync, Anti-Aliasing (FXAA or TAA), Motion Blur (on/off), Depth of Field (on/off) and ambient occlusion (on/off). There are no options to play Dark Souls Remastered with enhanced textures, shadows or increased geometric detail, offering PC players almost no room for graphical adjustments. Dark Souls: Remastered doesn't even include Anisotropic Filtering or FOV options, both of which are considered basic settings for most seasoned PC gamers.